Inside the TV deal that caused Washington DC's Citi Open tennis tournament to be separated from the US Open Series for 2015. WASHINGTON – The Citi Open in Washington, which has spent 47 years in Rock Creek Park under various names, has stayed in one location longer than any other tournament in the United States. But unhappy with the hand dealt to it by the USTA and ESPN this year, tournament founder Donald Dell decided it was time to make a move. In acquiring exclusive rights to the U.S. Open for the next 11 years, from 2015 to 2025, ESPN also picked up exclusive rights to the U.S. Open Series events. (These rights did not include deals with ATP Masters 1000 and WTA Premier 5 events, which are negotiated separately through the tours.) But ESPN only offered Washington four hours of coverage on traditional television (ESPN2), with an option for the tournament to purchase an additional two hours, leaving the rest of the tournament to wallow in the hinterland of ESPN3. Dell, who was inducted into the International Tennis Hall of Fame for being a pioneer in monetizing tennis as it became a professional sport, held out for a better offer while other tournaments signed up last November. "We're the only 500 series tournament in America, so I thought 'God, that's not a very good deal,'" Dell said. "We were very unhappy, and we expressed that to the USTA. Everybody on the circuit, the other tournaments, signed back in November to do all these things with the U.S. Open Series for four years, with another four-year option. I said, 'I'm never going to do that.' We're a different tournament than Atlanta or Stanford. I'm very much in favor of the U.S. Open Series, but I didn't know where we were going. The television, from ESPN's point of view, is being cut back, not expanded. I didn't really think it was fair to Washington, as one of the four combined events in America and the only 500, who puts up two million dollars in prize money in prize money and player compensation." Spotting an opportunity, Tennis Channel pounced on a loose end that ESPN had left dangling. "We were not unaware that all of this was unfolding, and we were not unaware that the USTA hadn't formally signed these tournaments when they made the ESPN deal," said Tennis Channel chief executive Ken Solomon. "We were bystanders, but it's our business, and we try to know everything." For Solomon, whose network no longer has a foothold at the U.S. Open or most of the summer swing, Washington represented a lone chance to control a stretch of the summer. Tennis Channel offered first-ball-to-last coverage for Washington, expanding the time on air from six hours to 171 hours. In a deal covering four years for $2.1 million, Tennis Channel would pay for all production costs, including televising a second court for the first time in the tournament's history. Tennis Channel would also set up large viewing screens in public spaces around the D.C. area, and buy advertisements in local publications, as well as the Wall Street Journal. "We had a choice to make, but there was really no choice," said Dell, who rejects ESPN3 as a way for ESPN to build inventory and gain exclusivity without showcasing the sport. "If you're running a tournament, and it's two million dollars, and sponsorship money in the six million to eight million dollar range, you've got sponsors that don't want to be having only four or six hours on television." The infusion of cash from Tennis Channel also allowed for the Washington tournament to improve onsite, both around the grounds and in its player field. Andy Murray returned to the event for the first time in nine years. And even with a rainy start to the week, overall attendance for the event was up by five percent. Total TV ratings for the Washington tournament on Tennis Channel were up 99% this year, nearly doubling the combined Tennis Channel/ESPN2 numbers of last year. Stanford's television audience, meanwhile, was down 76% with its limited broadcast window (and a lack of star attraction Serena Williams). Traditional ratings figures are not available for streaming services like ESPN3. The USTA, however, could not abide Washington's defection from the U.S. Open Series. The organization made it clear that even though the Series was originally built around a mélange of networks that included CBS and NBC, being exclusively on ESPN was now a requirement for membership. Dell said he did not find a replacement airline sponsor as a courtesy to Emirates, the title sponsor of the Series, which he hoped could be a gesture of good faith that would ease Washington's reintroduction to the Series as soon as next year. "I love the series, and I've done everything to stay in," said Dell. "They didn't want us to stay in, because we had such a good deal with Tennis Channel that they thought it would offend some of the other tournaments that signed their contracts six months earlier." Chris Widmaier, managing director of corporate communications for the USTA, expressed his organization's regret in losing one of the largest and original tentpoles of the U.S. Open Series, which has been synonymous with this part of the calendar since it was created in 2004. "Certainly we were disappointed in the decision by the Washington tournament to disassociate themselves from the Emirates Airline U.S. Open Series," said Widmaier. "That said, we still believe the Series is the strongest promotional platform for tennis during the summer here in the U.S."
While Washington may be sturdy enough to survive and thrive without the direct attachment to the Series, it has been a crucial support and legitimization for many of the swing's smaller events, which have less certain financial footing. "For us, being part of the Emirates Airline U.S. Open Series gives us tremendous credibility," said Eddie Gonzalez, tournament director of the BB&T Atlanta Open. "We really want to be that mini U.S. Open, and obviously the series culminates in New York. We're getting much healthier financially, and as a 250, 250s around the world typically struggle. We're one sponsor away from being in the black or the red, though for two years in a row we've been extremely successful, and that's due to not only being a part of the Series, but having a great title sponsor in BB&T and a great site sponsor with Atlantic Station." While Dell and the Citi Open will have another year to mend fences, there may be more immediate consequences for Tennis Channel. The USTA, which owns the rights to the WTA side of next week's Western & Southern Open in Cincinnati, the biggest event of the Series, stunned Tennis Channel during Washington by saying that the network would not have rights to women's matches the event, leaving them only able to broadcast the men's matches it has through a separate deal with the ATP. One group who didn't seem bothered by Washington's departure were the players themselves. 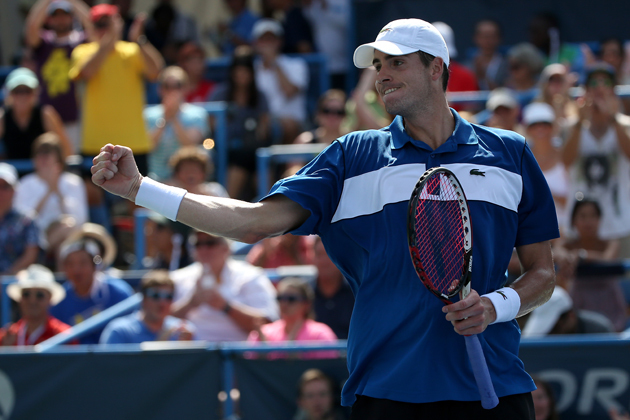 John Isner, a stalwart of the American summer hardcourts who has finished in the money at the end of the U.S. Open Series for four consecutive years, said he didn't even realize that Washington was no longer in the U.S. Open Series until his third day at the tournament. As well as he has done, he said the U.S. Open Series dwindling or disappearing wouldn't be of major concern to him. "I wouldn't lose sleep over it," he said. "But I've always played very well on the U.S. hardcourts. I know I've finished in the top three a few times, but if it were to go away it wouldn't change anything for me. I'd still be very motivated out there." Though most players, like Isner, were largely unaware of the move and frequently referred to Washington as part of the Series, one American who had heard more of the specifics expressed his gratitude toward Dell. "I think Donald did a great job getting us on Tennis Channel," he said. "We would have been on ESPN3, which nobody knows or watches. I don't know how many people watch ESPN3; I mean, I know I don't."